Following the economic crisis in 2000 and 2001, entrepreneurial activity in Argentina has increased over the last decade in line with the economic recovery. The government has started working on national and local level initiatives with varying degrees of intensity; however, the main challenge remains to how to implement these public policies and programmes in order to enable companies to grow. While many of Argentina’s entrepreneurs (61.6%) believe that they have the skills and knowledge to start new ventures, there is a growing sense among the population of a lack of opportunities for entrepreneurship, primarily due to the economic crisis. The percentage of Argentines that perceive good business opportunities has declined – from 56% in 2011 to 32% in 2014. Despite this over the same period the percentage of adults who intend to start up a business in the next three years has remained fairly stable at about 30%. Almost two thirds of entrepreneurs are motivated by opportunity rather than by necessity. However, Argentina still has one of the more difficult business environments in the world, ranked at 121st (out of 189 economies) in the 2016 Doing Business report, having declined from 117th the year before. Under a special initiative, the Line to Fund Productive Investment (Línea de Inversión Productivo) introduced in 2012 by Argentina’s central bank, banks are authorised to set aside a certain percentage of loans for the productive sector. This measure is similar to an initiative in India which has been in place since 1969. Banks must by March 2016 ensure that they lend a minimum of 7% of their net credit to small businesses and a minimum of 7.5% by March 2017. Banks that fail to do so will be made to pay the shortfall into a rural development fund. The initiative obliges financial institutions, whose average private sector deposits over the last three months is equal to or greater than 1% of total bank credit, to allocate in the form of loans at least 16% of these deposits to SMEs to fund productive investments. The funds can’t be used to fund land or to finance working capital. The obligatory percentage is reviewed by the central bank every six months and adjusted if necessary. In May 2016, Argentina’s President Mauricio Macri announced new measures to support the country’s SMEs, including raising the obligatory percentage of loans that banks must make to the sector from 14% to 16% of net credit. When this measure will come into effect in July 2016 it will ensure that about 137 billion pesos ($9.6 billion) will be channeled over a period of six months to SMEs. The measures are intended to offset Macri’s vetoing of an earlier measure introduced in Argentina’s congress to ban businesses from firing employees for three months. At the same time a number of other tax and finance measures were also announced by Macri to support SMEs, including the creation of a fund (Mi Primer Crédito) by Argentina’s Bank for Investment and Foreign Trade (Bice) to finance SMEs who have never received bank finance before. A central bank report reveals so far, that most banks have been able to meet the targets and credit to SMEs has increased - from 28% of all bank credit that went to businesses (excluding credit advanced on credit cards) in 2011, to 45% of credit in 2011. Under central bank rules, banks that fail to adhere to the targets are to be fined or have their banking licence revoked (under Section 41 of Argentina’s Law of Financial Entities). According to a recent report there is a strong argument for the central bank’s intervention. In 2014, Argentina only channeled 17% of GDP worth of finance to the private sector, compared to 69% in Brazil and 109% in Chile. In addition, a report in 2015 by the University of Avellaneda suggests there is space for more credit to be channelled to SMEs, as just 11% of small businesses use bank loans to fund investment, compared to 20% of large companies. However, an earlier 2013 report by Observatorio PYME noted at the time that the central bank initiative was not enough to spur lending to SMEs, with many small manufacturers holding off on investing because of the poor economic climate and unavailability of funds in the country at the time. While the economy is still struggling and expected to contract by 0.7% in 2016, the new administration’s move to settle Argentina’s international debt and open the country’s markets to global producers, bodes well for SMEs. With the economy set to rebound in 2017, small businesses will need all the help they can obtain finance. Reporte Ejecutivo del proceso GEM 2016, publicado en Marzo 2017. 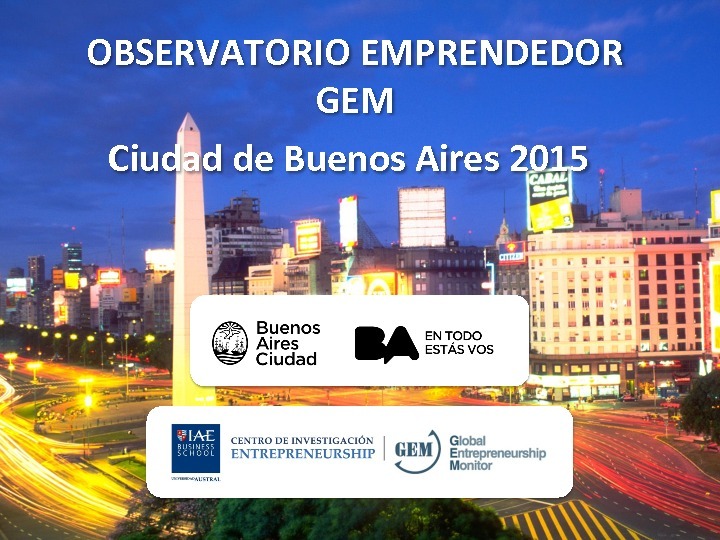 Executive Report for Argentina GEM 2016 process , published on March 2017. Gráficos y Tablas de análisis del proceso GEM Argentina 2016 publicadas en marzo 2017. Figures and Tables for Argentina GEM 2017, published on march 2017.